The award was created by the Heritage Council of Victoria in recognition of the significant role volunteers play in the maintenance and preservation of Victoria’s heritage. “In Australian Heritage Week, Lesley Barnes OAM has been recognised for her tireless work since 1975, fundraising and organising major events for the National Trust and her abiding commitment to Gulf Station,” Chair of the Heritage Council Mary Urquhart said. 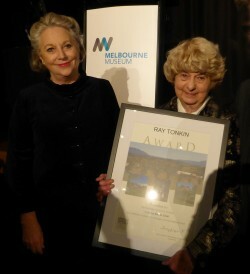 The Ray Tonkin heritage volunteer Award, named after the former Executive Director of Heritage Victoria, was created by the Heritage Council of Victoria five years ago in recognition of the significant role volunteers play in the maintenance and preservation of Victoria’s cultural heritage. “Lesley’s volunteer activities for the Trust have been extensive ranging from historical tours, luncheons, theatre, talks, workshops, musicals and art exhibitions. She has worked tirelessly for Gulf Station for many years and is the chair of the Friends and Relations of Gulf Station committee. “The National Trust, which relies on the work of thousands of volunteers, declares that Lesley ‘shines like a beacon’ among them,” Ms Urquhart said. Australian Heritage Week runs from Saturday 11 April until Sunday 19 April. Lesley was presented with the award at the Heritage Council’s annual heritage address held at Melbourne Museum on 14 April.